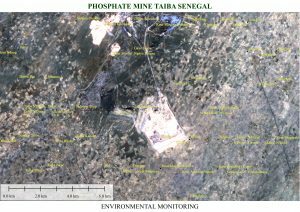 In the coastal zones of Senegal, the presence and spread of phosphate and zirconium mines poses a great threat to ground water resources, and prevailing winds distribute dust charged with chemicals into the surrounding villages and fields. Space2Live works closely with local NGOs (like the Pan African Institute for Citizenship, Consumer Rights and Development (CICODEV) and Enda Third World in Dakar), and trains them to use simple mapping software and GPS tracking. Currently we are working with high-resolution open-source satellite imagery (Sentiel-2) to visualize the problems caused by the mines on both the environment and the surrounding villages and their fields. While most of the villages do not appear on Google Maps, Sentinel images allow us to track the extent of environmental and social damages in more detail and on a monthly basis. The next step will be to complement the information from the satellite pictures with on-site surveys and GPS tracking to increase the value and detail of the data. A related project is in preparation with the non-governmental organization CICODEF, member of the International Land Coalition, based in Dakar.